The disabled people in Cameroon have for long experienced a noticeable increase in their social and economic exclusion from active life. 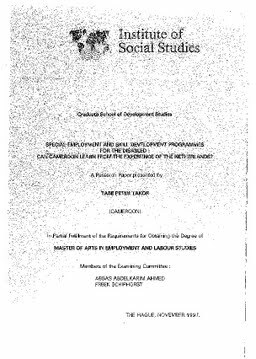 This steady degradation in their socioeconomic status originated not only from the negative societal attitudes towards the notion of disability and the inadequacy of existing 'facilities, but also from the sheer absence of the will to implement the seemingly attractive laws and policies that purport to address their employment and training needs. From a definitional standpoint, a disabled person is anyone who experiences significant limitations in one or several functions because of a physical, sensorial or mental impairment or deficiencyl. As a result of the limitations and the accompanying negative societal attitudes, the disabled person experiences restrictions in his ability to fully develop his or her own potential and to earn a living commensurate with his or her innate qualities and abilities. These barriers are not only most apparent, but equally accentuate~, in Cameroon when the disabled persons put in tireless efforts to overcome the huge challenges of mainstream development, but end up disappointedly being discriminated upon on the basis of their physical state.